Scrapbooking doesn't have to be an expensive hobby if you're resourceful. All you need is time and creativity to make a pretty scrapbook cover with great visual impact, that won't impact your wallet. Click on the image of the scrapbook that best fits your photo theme. Download the PDF file to your computer. Click on the image squares to add the photos you would like to include. Click on the text spaces to add photo captions and other relevant details. 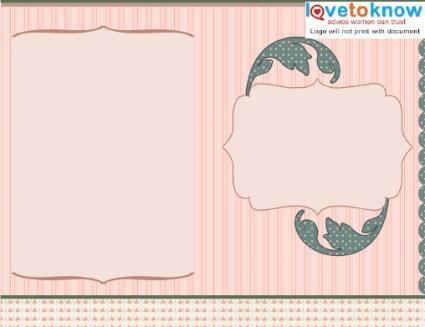 Print your scrapbook using the highest quality settings on your computer and checking to make sure you've selected the borderless printing option. Place the paper in front of you with the printed side face down. Fold in half horizontally, then unfold. Fold the left and right sides in to the middle crease. Unfold. Fold the paper in half vertically, then unfold. Now, you should have creases that form a grid of eight equally-sized rectangles. Fold your paper in half horizontally. Cut the crease along the middle, stopping when you reach the point where it meets the first vertical crease. Fold your paper in half vertically. Hold paper at the left and right edges and push towards the middle. The two center panels will separate to form a cross shape. Flatten the folds to complete your mini scrapbook. 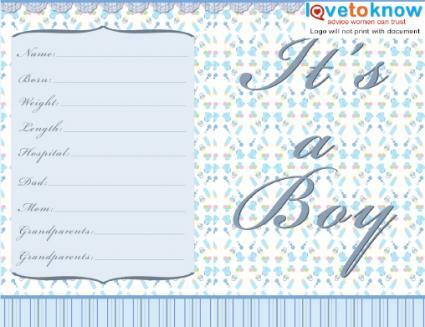 Download this printable baby boy mini scrapbook. 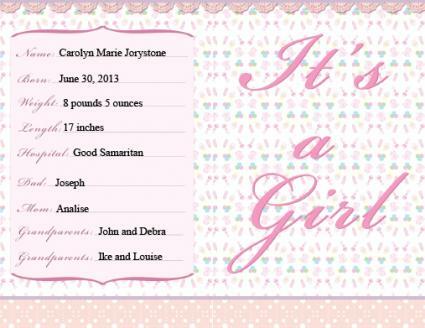 Download this printable baby girl mini scrapbook. Download this printable travel mini scrapbook. 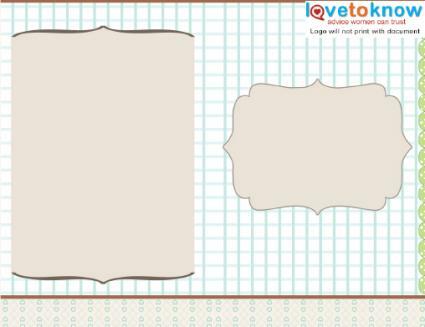 Download this printable blank mini scrapbook. The Cinch from We R Memory Keepers is a binding machine that lets you punch up to 20 sheets of paper at one time to make your own wire or spiral bound book. If you own a Cinch or can borrow one from a friend or your local scrapbook store, it's easy to create this scrapbook cover. 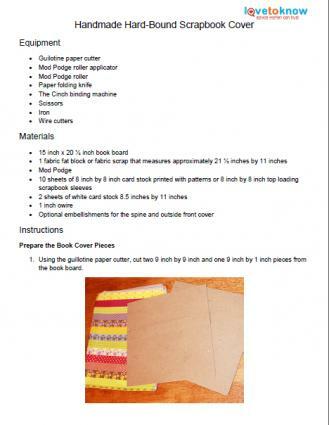 For this project, fabric is applied to a Mod Podge book board cover. Be careful to apply the Mod Podge sparingly, since using too much adhesive increases the risk of bubbles in your project. Click on the thumbnail below to download or print the PDF instructions. If you don't want to use fabric for your scrapbook cover, you could decorate the book board with strips of washi tape, which is a type of patterned masking tape that can be purchased at your local craft store. Mixing different tape patterns together would be an easy way to make an appealing album cover. When making cheap scrapbooks, keep in mind that albums with page protectors tend to be less durable over the long term than those that have protective covers on each layout. If you're making a book that doesn't use page protectors, you'll need to remember to use plenty of strong adhesive and to limit the number of bulky embellishments you include on each page. To keep costs down when making your layouts, try using found materials like paint chips, colorful clothing tags, and images cut from greeting cards as scrapbook embellishments. Instead of purchasing patterned paper for your scrapbook, try making your own by using watercolor paint to make polka dots, hearts, stars, and other simple designs on your layouts. If you enjoy making this project, The Cinch could also be used to bind together paper bags or envelopes to make a scrapbook that has space for storing memorabilia. 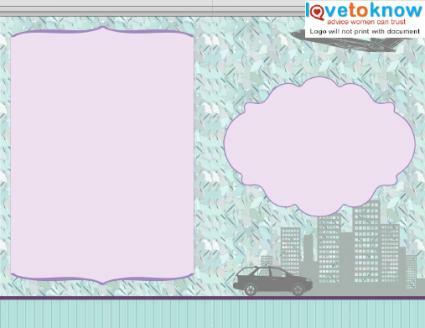 Here are a few other options available for making a scrapbook album. Vintage Indie has a PDF tutorial illustrating the Japanese stab binding technique. In addition to being useful as scrapbooks, this type of book is often used as a guest book at weddings and graduations. Design Sponge offers a tutorial for a five-hole pamphlet stitch. This results in a smaller pamphlet type book that would be appropriate for scrapbooking a vacation or other special event. Throwing Waffles features instructions for a simple ribbon bound book. 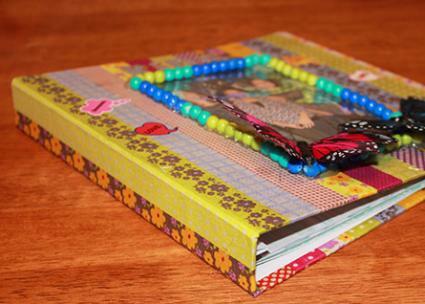 This would be a great project to try when scrapbooking with a child. Nerd Nest has a unique technique that involves using the cover of an unwanted hardcover book to make your scrapbook album. This would make for a cute gift album if you were able to find a cheap copy of the recipient's favorite book at a thrift store. The best part about scrapbooking is that creativity counts for more than your project budget. Even if you don't have a lot of money to spend, adding your own special creative touches can turn your album into a one-of-a-kind masterpiece.